In regards to working the patch It's been a very slow start to the year with nothing of note throughout January, and I was starting to wish away February so I could hit March with a spring in my step as thoughts of early spring migrants helped raise the spirits, but February wasn't going down without a fight and only goes and delivers a rather fine patch tick in the form of a Pheasant - in these parts Pheasants are not to be mocked as these birds are rare - with only five records in the last decade! The bird had been reported hanging around the new horse paddock in the the Old Sewage Works and was duly confirmed and ticked by those who are able to bird the patch during the week, but for us weekend birding warriors it was Saturday morning until I had my first attempt at adding this bird to the patch list. 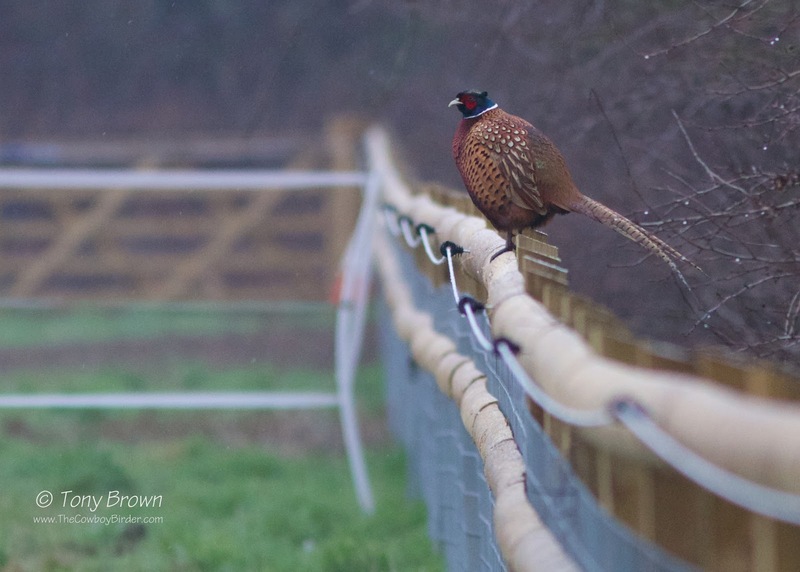 Unlike a certain Cetti's Warbler which played hardball last spring in the same area, the Pheasant did the decent thing and was parading around the horse paddock as soon as I turned up shortly after first light. A dog walker soon had the bird running for cover and into the 'big hedge' but within minutes it had popped out again and happily stood on the paddock perimeter fence - looking quite at home, as if the bird had always been apart of this manor. The strange thing was, once you've seen a Pheasant on the patch and as good as that was, you don't hang around studying its finer details or behaviour...it is after all just a Pheasant, so I didn't linger and left to cover the rest of the patch which again was painfully slow and bereft of birds - so thanks February for this little winter gift but roll-on March.